I’ve been reading Soccernomics in preparation for the World Cup, and it’s basically the Moneyball of soccer. So far, the most interesting part has been about how soccer clubs that help acclimate new, foreign players to the team and region find much more success than letting players fend for themselves. It makes sense. As is so often the case in soccer, players are transferred to new teams in different countries that speak foreign languages and have unfamiliar customs. Aiding a player with relocation and language classes can pay back a team many times over. Businesses have know this for years, which is why they offer relocation assistance and more, even for intra-country moves. Another assertion in the book was that fitness matters. A team that is capable of going the full 90 minutes (or more) has a big advantage over teams that start out fast but slow down (like England). 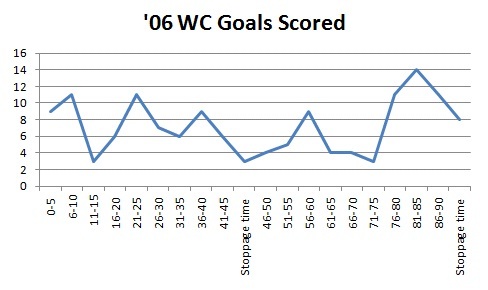 I wondered, in the 2006 World Cup, were there more goals scored in the last 10 minutes of the game? It appears that there are more goals scored in the final 10 minutes. There could be several contributing factors. Teams could be going all out in desperation to stay alive in the tournament. These could be “junk goals” that don’t affect the final result. But, fitness is likely a contributing factor. Adding standard deviation lines makes the picture even clearer. What does this mean for the US team? Coach Bob Bradley has put a lot of emphasis on training and fitness. He reinforced this by excluding Brain Ching and Charlie Davies from the roster, who are still recovering from injuries and are not in game shape. And, Bradley added speedy striker Robbie Findley, who many expect could be a late-game sub. Looks like the US team is built to take advantage of poor fitness on the other side of the ball. The lesson for fans is, while watching World Cup games this June and July, whatever you do, be back in your seat by the 76th minute so you don’t miss all the action at the end. 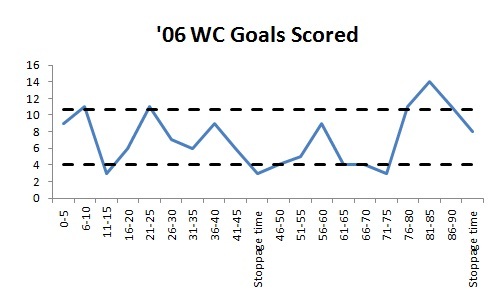 Follow all my World Cup statistical analysis here.